Capacity management refers to the process of planning, analyzing, sizing, and optimizing methods to satisfy an organization's never-ending increase in data storage demands. It is important to understand the challenges related to capacity management to help you become more proactive and responsive to business needs. Responding to capacity issues almost always results in an impact on efficiency, performance, and user satisfaction. 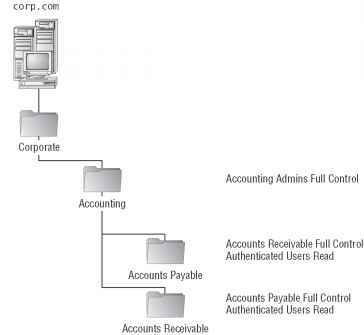 Capacity management is also an attempt to control the misuse of corporate storage. Many users tend to store large personal multimedia files, such as MP3s or digital photos, as well as other types of data, such as screensavers and games. Much of this content is stored in personal home directories or shared on corporate storage locations. Part of capacity management planning is determining effective methods for controlling the type and amount of data that is stored on your corporate network. 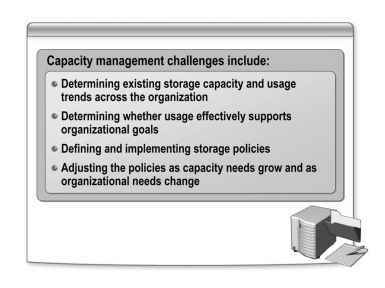 ■ Determining existing storage capacity and usage trends across the organization. It might be difficult to obtain an accurate inventory of existing storage capacity and current usage trends. ■ Determining whether usage effectively supports organizational goals. You need to understand and identify where storage capacity is used inefficiently to determine measures to address capacity issues and match the goals of the organization. ■ Defining and implementing storage policies. After existing storage capacity and goals have been determined, mechanisms must be identified and implemented to prevent future capacity misuse. ■ Adjusting the policies as capacity needs grow and as organizational needs change. To be proactive against future capacity issues, it is important to manage and monitor usage patterns and utilization levels. Storage Management Similar to capacity management, storage management refers to the process of defining, monitoring, and maintaining data and data resources. Storage management also involves additional tasks such as data classification and security, as well as developing a strategy to ensure that backup, restore, and recovery tasks address business requirements and service-level agreements. Management more direct attached storage (DAS) to a server increases complexity, and it does not solve many data protection or high-availability problems and is often limited by basic scalability issues. Implementing a Network Attached Storage (NAS) or a storage area network (SAN) solution is desirable for many companies; however, most administrators have limited experience with SAN technologies and the existing tools are complex and expensive. NAS solutions may address some basic storage requirements, but NAS solutions address only the file serving workload and not the database, e-mail, and other mission-critical applications. ■ Many organizations experience a growth in storage requirements from 60 to 100 percent per year. The increase in e-business, e-commerce, and e-mail typically results in the management of many terabytes of data. ■ Mission-critical data must be continuously available. Users expect to have instant access to mission-critical data when needed, which results in more data having to be stored and available for users. ■ Organizations must comply with the latest regulatory requirements. New regulatory legislation requires long-term archiving and security of many types of data, which results in the need for additional storage. ■ The number of storage-intensive applications on the market has increased. Many of the latest business applications require access to an adequate amount of storage space. Which of the following options is the windows server capacity management challenges?